If you’re looking for a foolproof recipe with guaranteed deliciousness, we recommend this sinful no bake cheesecake to please mum this Mother’s Day. Line the base of a 20cm springform tin with baking paper and lightly grease the sides. Set aside. Blend / crush biscuits until it turns into fine breadcrumbs. Add butter to mixture and combine well. Pour the biscuit mixture evenly into your prepared tin and press down with the back of a spoon to flatten the surface. Refrigerate for 15 minutes. In a bowl, pour 1 1/2 tsp gelatin into 1/4 cup hot water and mix well. Keep aside to cool. In another bowl, add the softened cream cheese and caster sugar and beat with an electric mixer on medium to high speed, until the mixture is thick, creamy and smooth. Add in gelatin and whipped cream into the cream cheese mixture. Combine well. Meanwhile, chop the Mars bars into small pieces and place in a microwave-safe bowl. Heat in a microwave oven for 15- 30 seconds (stop to stir every 10 seconds or so) until the chocolate has melted. Be careful not to burn the chocolates. Prepare another microwave-safe bowl for the white chocolate. Repeat the process until the chocolates have melted. Divide the cream cheese mixture into 2 separate bowls. Pour the melted Mars bars into the first bowl. Mix well using a spatula or an electric mixer. Pour the melted white chocolates into the second bowl. Mix well. Pour the 1st and 2nd cheesecake mixture over the biscuit base. Cover and chill it in the fridge for 4 to 5 hours to set before serving. 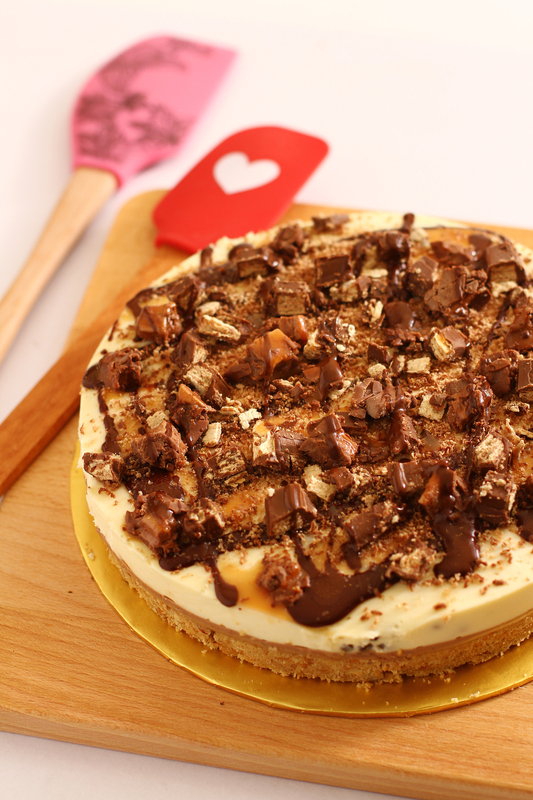 For garnish, you may also sprinkle some chocolates slices /flakes on top of the cake.